The Defense Department will lift all gender-based restrictions on military service starting in January, Defense Secretary Ash Carter announced Thursday. 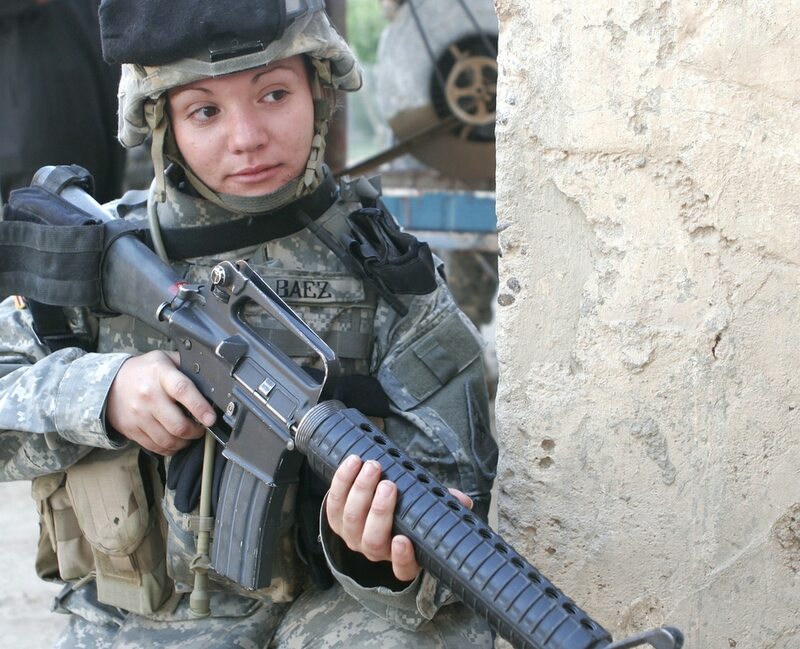 The historic change will clear the way for women to serve alongside men in combat arms units. Carter's decision comes as a rebuke to an internal recommendation from the Marine Corps that sought to keep some jobs closed to women. In contrast, the Army leaders recommended opening all combat arms jobs to women. "While the Marine Corps asked for a partial exception in some areas such as infantry, machine gunner, fire support reconnaissance and others, we are a joint force, and I have decided to make a decision which applies to the entire force," Carter said at a Pentagon press briefing Thursday. "The important factor in making my decision was to have access to every American who could add strength to the joint force," he said. In effect, Carter's decision will open to women about 220,000 jobs in all, or about 10 percent of the entire active and reserve force. Most of those jobs are in Army and Marine Corps infantry and armor units. FACT SHEET: What positions are opening? Download the list. At its core, the decision means that as of Jan. 2, female service members — both current and incoming recruits — will be allowed to serve in any military job for which they meet the gender-neutral performance standards and other requirements. "They'll be allowed to drive tanks, fire mortars, and lead infantry soldiers into combat. They'll be able to serve as Army Rangers and Green Berets, Navy SEALs, Marine Corps infantry, Air Force parajumpers and everything else that was previously open only to men," Carter said. "And even more importantly, our military will be better able to harness the skills and perspectives that talented women have to offer." Carter made the announcement at a Pentagon press briefing. Absent from the briefing was Marine Corps Gen. Joseph Dunford, the relatively new chairman of the Joint Chiefs of Staff, who was serving as commandant of the Marine Corps earlier this year when the Corps made its pitch to keep some gender restrictions in place. Dunford was in the Washington area Thursday attending a series of meetings, officials said. His absence raised questions about his support for Carter's decision. The top general issued a statement Thursday that stopped short of agreeing with the decision. Earlier this year, the Marine Corps outlined a justification for that stance by publicly releasing some results of a yearlong study that concluded male-only units performed better overall than gender-integrated units. Specifically, that Marine Corps-sponsored study found that male-only infantry units shot more accurately, could carry more weight and move more quickly through some tactical maneuvers. The study also found higher injury rates for women than for men. Carter acknowledged that the Marine Corps' recommendation was based on a conclusion that allowing women to serve in combat units would jeopardize readiness and combat effectiveness, but said he disagreed with that assessment. "I believe that we could, in the implementation process, address the issues that were raised," Carter said. The Army, in contrast, has shown strong support for opening all military occupational specialties to women. So far this year, three female soldiers completed the prestigious Army Ranger School and earned the Ranger tab. In November, the Ranger School's first fully integrated class got underway at Fort Benning, Georgia. For the Navy, the impact will be felt mainly in to the SEAL community, which was historically limited to men. The Navy integrated its fighter pilot career fields in the 1990s and began allowing women to serve on submarines several years ago. For the Air Force, the change will affect six occupational specialties that had been closed to women: special tactics officer and combat rescue officer, and the enlisted fields of special operations weather, combat control, pararescue and tactical air control party. Those gender restrictions affected roughly 4,000 positions. Navy Secretary Ray Mabus voiced strong public support for lifting all gender restrictions, including those for Navy SEALs, yet Dunford, commandant of the Marine Corps at the time, disagreed. The Corps' nine-month study compared all-male units to mixed-gender units and included battlefield simulations examining the impacts of integrating women into combat roles. The Corps released only parts of the study's final report, which highlighted unit cohesion problems and increased rates of injuries for women. Critics said the Corps' study was flawed because it failed to take into account that many of the male Marines, unlike the females, had prior training in the combat arms, and also because it focused on average results rather than individual results. Thursday's announcement was greeted with some skepticism on Capitol Hill. The leaders of the House and Senate armed services committees, Sen. John McCain, R-Ariz., and Rep. Mac Thornberry, R-Texas, issued a joint statement vowing to take a close look at the issue during Congress's 30-day review period. "The Senate and House Armed Services committees intend to carefully and thoroughly review all relevant documentation related to today's decision, including the 1,000-page Marine Integrated Task Force report. We expect the department to send over its implementation plans as quickly as possible to ensure our Committees have all the information necessary to conduct proper and rigorous oversight," the statement said. The Pentagon does not need direct approval from Capitol Hill to move forward on Carter's decision, but strong opposition from Congress could pose problems in implementing related policies. The Pentagon leadership's final decision on lifting all gender restrictions has been influenced by a pending lawsuit from several former female service members who claim the combat exclusion rules violate their constitutional rights. The change was also driven in part by support from the White House and President Obama's interest in expanding opportunities for all Americans to serve in the military. In 2011, Congress passed, and Obama signed, a law to end the prohibition on open military service by gays and lesbians. And the change also was fueled by claims from women that the restrictions limited their ability to ascend to the military's highest level of leadership, which is often filled with officers who served in the combat arms. It also comes after 15 years of counterinsurgency operations that made rules referencing "ground combat" seem out of step with missions targeting a shadowy enemy that used nontraditional, asymmetrical tactics. During a decade's worth of conflict, more than about 300,000 women were deployed to Iraq and Afghanistan. More than 9,000 female troops have earned Combat Action Badges. More than 800 female service members have been wounded and at least 161 have died from combat- and noncombat-related incidents, according to Defense Department data.